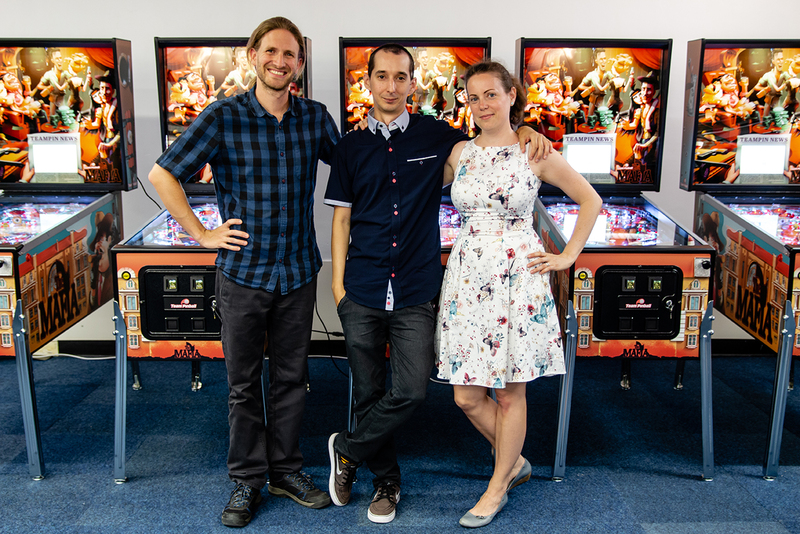 Team Pinball is a new UK-based pinball company, located in Cardiff, formed by Romain Fontaine, Janos Kiss, and Otilia Pasareti. All three used to work for Heighway Pinball earlier on, but left the company over two years ago. The three have since been working on designing a pinball machine of their own. Their first game is called The Mafia and was presented July 21st to the local Cardiff press, Pinball News, and Pinball Magazine. Team Pinball: Romain Fontaine, Janos Kiss and Otilia Pasreti. The Mafia is themed around the heydays of Al Capone and contains many newly recorded voice calls that remind of classic mafia movies and TV shows, such as The Godfather, Sopranos, Goodfellas, Scarface, and others. The game was designed with classic electromechanical pinball games in mind. As such it’s a single-level, standard sized, two flipper game without multiball. While Team Pinball exists of three people, they did work with more people to create artwork, voice calls, and other elements. The playfield of the game is designed by Balint Ats, a former Zen Studios pinball designer who designed many pinball games for them. He also briefly worked for Heighway Pinball. Balint is not part of the company, but he is part of the design team for The Mafia. The artwork on the game is by Attila Szabo (ATALOGY). Janos Kiss has been in charge of programming the game. Romain Fontaine did the electronics engineering. The music in the game has been specifically composed for the game by Adam Gubman of Moonwalk Audio. The whole project was managed by Otilia Pasareti. Team Pinball plans to build a maximum of 100 games of The Mafia, so production is rather limited. The game seems to be aiming at pinball collectors who are looking for an unusual, exclusive game. 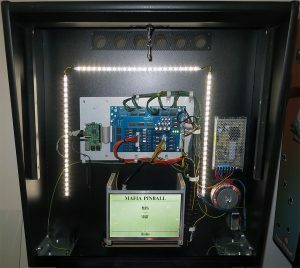 Pinball Magazine was invited to play the game, which at the moment still needs some additional game code, but all the hardware and basic elements of gameplay are there. During gameplay, players should shoot for the left and right orbit and the captive ball to start a hurry-up mode in which they have to shoot for the casino, train or the diamond target. The spinner in the center also builds up to a hurry-up mode in which the right orbit has to be shot. Shooting the two standup targets next to the spinner will build the spinner value. While the rules of the game appear to be simple, once explained, they are in the current game code not that obvious to discover during gameplay. However, the code is still being worked on and some suggestions were even implemented on the fly. While the rules may be simple, they turn out to be pretty hard to achieve as well. What is rather unique these days is that this boutique company announces themselves and their first games and have already handbuilt ten games, which are ready to ship. More games will be build when orders come in. They have been talking to several distributors, among who are Pinball Star in the U.S., Nitro Amusements in Canada, Free Play in Sweden and R.S. Pinball in Austria. 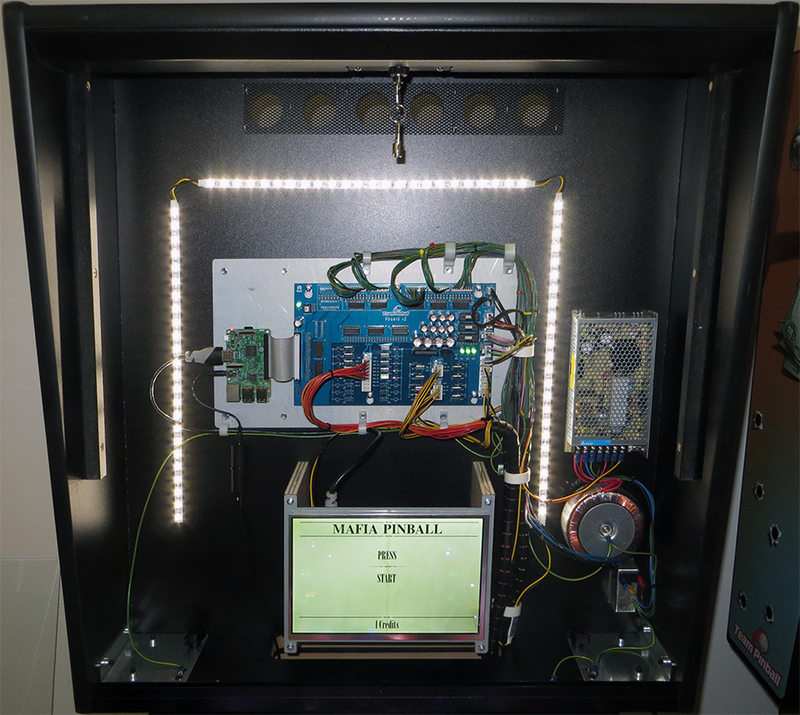 The Mafia is the first commercial Raspberry Pi controlled pinball machine. While the technical side of the game may look simple, the flippers, singshots and popbumpers respond very well, just like a professional pinball machine. The game is equipped with an HD LCD in the backbox that displays scores and black and white cartoon style animations. 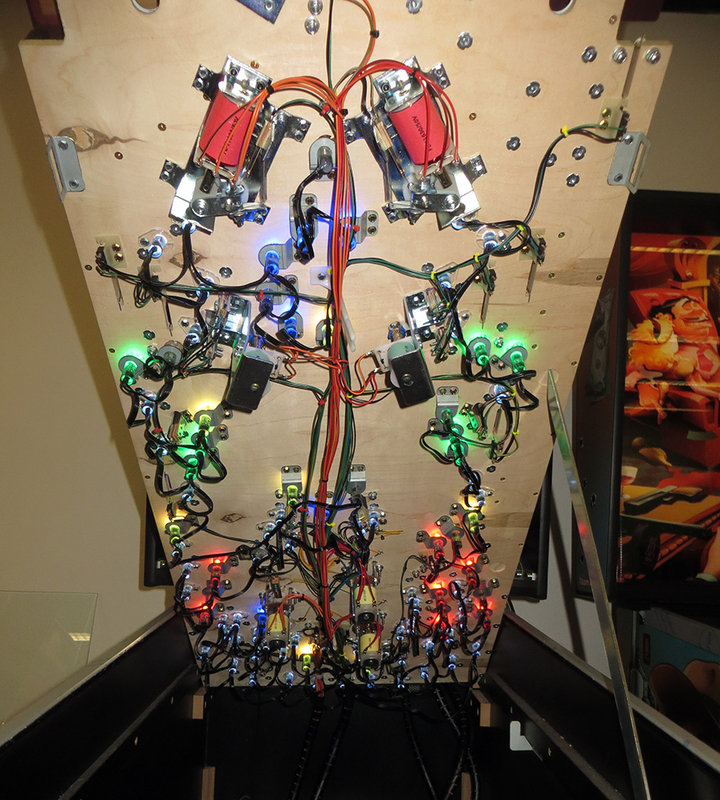 The playfield is fully equipped with RGB LEDs. The playfield itself is a blank piece of plywood with a reverse-printed playfield protector that has all the artwork on it. This is a rather unusual technique, but it actually works pretty good. In case it gets scratched, it will be easy to replace the protector, and the game will look as new again. For more info on Team Pinball and their game, visit their website, or a first review of the game by Pinball News.